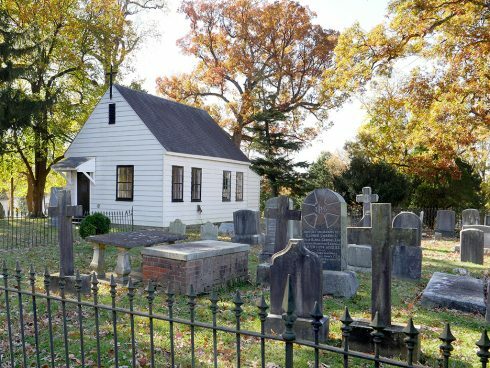 Formal efforts to inventory cemeteries in Montgomery County began in 2004 sponsored by Peerless Rockville, Historic Takoma, Inc., and the Coalition to Protect Maryland Burial Sites supported by a grant awarded by the Montgomery County Historic Preservation Commission (HPC). Subsequent phases of the volunteer effort continued from 2005 through 2009, resulting in a final written report including description forms for each identified cemetery, photographs, and a geographical information system (GIS) database of the recorded locations. The Planning Department makes these data available to the public via the MCAtlas webportal. In 2018, Montgomery Preservation, Inc. with the support of a grant from Heritage Montgomery began an intensive volunteer program to revisit the sites identified in the 2006 Cemetery Inventory to improve the locational data with cell-phone global positioning system (GPS) readings, current photographs, and additional descriptive information. Dozens of volunteers physically revisited all of the 266 cemeteries identified between 2004 and 2010, and conducted historical research to identify more burial sites, bringing the total to 322. Montgomery Preservation developed survey forms and protocols, trained volunteers in recording phone GPS coordinates, taking standardized photographs and completing a detailed description form. Within a span of less than 12 months, 266 of the 322 cemetery sites were visited, including 52 sites newly identified since 2010. The results of the Montgomery County Cemetery Inventory Revisited project were delivered to the Planning Department in December 2018. These data were reviewed by Historic Preservation staff for accuracy and sufficiency, and some attribute data (such as personal information about cemetery project volunteers) was redacted.